Home Group Therapy Why Groups? “How are you today?” is a common question we all ask each other. For many, there isn’t a supportive individual in their lives who remain in one place long enough to listen for the answer to that question. If you are someone who desires to sit in a safe and confidential environment with others who are experiencing similar life stressors, and you wish to learn how to better achieve positive outcomes, then Interactive Group Sessions are for you. Don’t go it alone. There is such comfort in Interactive Group Sessions. It’s like sipping coffee with a good set of friends. Everyone is working together for a common goal – healing and moving on with life. What are Interactive Group Sessions? Interactive Group Sessions are fun and rewarding. Each session will be led by a trained, licensed professional therapist who will assist the group in achieving their weekly goals. Members of the group are encouraged, but not required, to participate in every session. If you do not want to share every week, that is acceptable and your choice will be honored. As an active participant you will achieve maximum results. 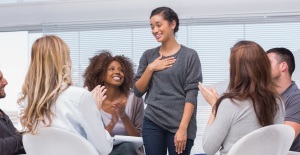 For group sessions to be most beneficial, regular and consistent attendance, mutual respect, being non-judgmental to other members in the group, and above all, being able to listen and allow other members to talk and share is strongly encouraged. Members will be surprised by the value they gain in listening and learning from others’ life experiences. Remember, there are no right or wrong answers. This is your life we are talking about. You are the captain of your fate. You are the master of your soul. I am ready to take the next step. Now what? First of all, congratulations on taking the first step toward making healthier choices and in learning how to improve the outcomes in your life! Now, you have a few options toward reaching the goal of determining which Interactive Group Session is right for you. If you are already in counseling, talk to your therapist about Interactive Group Sessions to determine if this is a good fit for your personality, current life situation and where you are in your counseling relationship. If it’s determined to be the right match, you may continue working with your counselor while you attend the Interactive Group Session or you may take a break. With your permission, your counselor may contact PCS-Counseling to discuss your options with one of our therapists. If you are not currently working with a counselor, you can schedule a phone appointment with a PCS-Counseling therapist to discuss joining an Interactive Group Session. This consultation session does not commit you to joining a group, rather it gives you an opportunity to talk more about your options and explore which session might best fit your needs. The therapist will work with the group facilitator to make sure you are placed within the correct session. You may also sign-up directly online by going to the page of the group you are interested in.